Bosses at the council responsible for Grenfell Tower received bonuses totalling more than £90,000 in the year after the fire, it has emerged. It was also revealed housing staff at the Royal Borough of Kensington and Chelsea had bonuses totalling £131,800. A survivors' group called the payments "abhorrent" since some households still do not have permanent homes. RBKC said bonuses were based on an employee's "individual performance" and the scheme was under "full review". The council also said: "No-one got a bonus specifically for helping respond to the fire." The fire in north Kensington on 14 June 2017 killed 72 people. Figures, obtained by the BBC via a freedom of information request, showed 12 employees in leadership roles at the council received a total of £93,174 in bonuses in May or June of 2018 - an average payment of £7,765 per employee. The council did not respond when the BBC asked for the salary brackets of staff in these positions. The amount spent on annual bonuses for leaders in the local authority has remained broadly stable since 2014/15, the earliest year for which data was provided, with the figure fluctuating between £92,418 and £99,463. The number of council bosses who received bonuses increased to 12 in 2017/18, from 11 in previous years. In May or June 2018, 52 members of staff working in housing received £131,804 in bonuses, an average of £2,534 per employee. The council did not say whether there was an overlap between the total figures for bonuses paid to leaders and housing staff. Image caption A survivors' group called the bonus payments "abhorrent"
Both the amount spent on bonuses and the number of staff working on housing at the council increased in 2017/18. In 2016/17, 43 housing staff received £103,298 in bonuses between them - an average payment of £2,402. 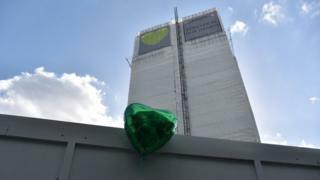 Around 21 months after the Grenfell Tower fire, 67 households from the estate have yet to move into permanent homes, according to the latest figures released by the council. Spike Western, a spokesman for the North Kensington Law Centre, which has been working to help rehouse former Grenfell residents, said the council "certainly has some explaining to do". He said staff at the local authority had been in a "difficult situation", but said homeless survivors had suffered from a "sub-standard public service". "While bonuses are being handed out to staff at town hall, the law centre has been successfully challenging unfair decisions they have made that are causing more stress to the residents," he added. Grenfell Tower fire: Who were the victims? Campaign group Justice for Grenfell described the payments as "vulgar" and said RBKC should "hang their heads in shame". "The fact that they've offered performance-related bonuses shows how desensitised RBKC were and remain to what happened at Grenfell," the group said. "Their barefaced audacity to reward housing staff, when some Grenfell families still do not have permanent homes is abhorrent. "Public sector workers are entitled to fair remuneration, but when senior managers help themselves to extra, it can only be classed as greed." Labour MP for Kensington Emma Dent Coad said she was "disgusted" by the payments. "Given the abject misery many Grenfell affected families have been left in, I find it extraordinary that senior staff have been offered bonuses," she said. "They have said that they want to get back to 'business as usual'. Handing out bonuses within a failing service proves they've achieved just that. A statement from Kensington and Chelsea Council said: "Our permanent staff are eligible for performance-related pay, based on individual performance, as set out in their legal contract of employment with us. "This is rigorously assessed every year and the overall scheme is currently subject to a full review." The statement added that the bonuses relating to pay for staff working in housing cover the whole department - and that includes home building, buying properties, and rehousing people. None of the eligible staff returned their bonuses in light of the tragedy, the council confirmed.